Hampton & Richmond Borough beat East Thurrock United to stay top of the Isthmian Premier League, but only just. After the disappointment of last Monday’s defeat at Wealdstone, Hampton’s first in the league this season, it was vital to put three points on the board by any means necessary at Rookery Hill. Manager Mark Harper named the same starting lineup as the match at Wealdstone, and it didn’t take long for his side to grab the initiative. Ross Gilbey struck a freekick straight at Chiweshe, who launched a counter attack. Joel Ledgister fed the ball to James Simmonds, and he fired home his first league goal of the campaign from twenty five yards out. The goal came on seventy seconds, and the visitors doubled their lead just six minutes later, Charlie Moone providing the assist for Ledgister to smash home from ten yards. After this dreadful start, the home side soon got themselves on top in the match, and Rodney Chiweshe was soon called into action, showing his agility to tip Hakeem Araba’s shot over the bar. The Rocks kept pushing forward, and missed some easy chances, most notably from Gilbey, who somehow put the ball over an unguarded net from close range. In fact, it wasn’t until the stroke of halftime that Hampton fashioned a clear scoring opportunity. Ledgister lifted a delicate lob over the defence for Moone to run on to. He beat the onrushing home keeper Richard Wray to the ball and touched it past him, but as he was in the process of slotting the ball into the empty goal, Rocks defender Simon Peddie got back and challenged, blocking the shot out for a corner. The travelling fans treated the half time score with a great deal of trepidation. After all, this was the exact same scoreline as it was at the break last Monday night at The Vale! It was Borough who had the first attempt of the second half, when Joe Turner fired narrowly over after being setup by Charlie Moone. In fact, despite dominating possession, the home side never really threatened to reduce the deficit, and the best chances were falling to Moone in particular. However, he hasn’t scored now since he netted the winner against Whitehawk on October 13th, and things don’t seem to be going his way at the moment. He did well to get in behind the defence, but seemed to take too long to shoot, and the defender got back to challenge. A few weeks ago, he might have taken the shot on first time. However, he is still Borough’s most likely scorer, and undoubtedly one of the hardest working strikers in the league, and he kept getting himself into scoring positions. A few minutes later, he fought his way through the home defence and shot, but Wray saved. He then combined with Malvin Kamara and set up Turner, whose shot went inches wide. At the other end, Sam Collins drilled a freekick through the penalty area, but it somehow evaded everyone as it went wide. Moone then had an excellent placed shot saved by Wray before he was substituted for Mo Bettamer. Four minutes from time, and the nervy ending to the match was guaranteed when Gilbey flicked home a cross to halve the deficit, and give the travelling contingent flashbacks and palpitations! 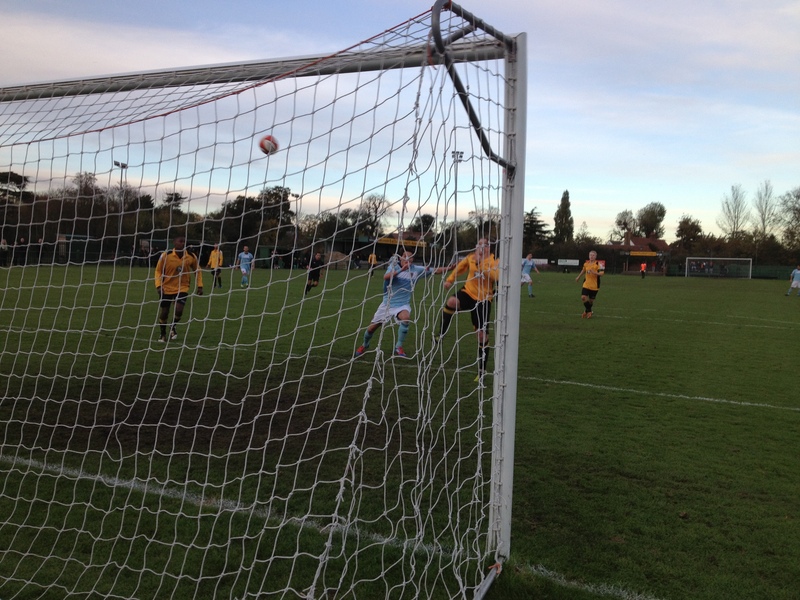 East Thurrock substitute Matt Hall curled a freekick over the bar, while Joe Turner shot straight at Wray after he broke quickly following another attack from the home side. Chiweshe then made another crucial and excellent save in the second minute of added on time, saving a Collins freekick at full stretch. Chiweshe then went down after a clash, delaying the final whistle. Finally, though, after nearly ten minutes of stoppage time, referee Jairo Marin brought an end to proceedings, and the away fans breathed a collective sigh of relief! 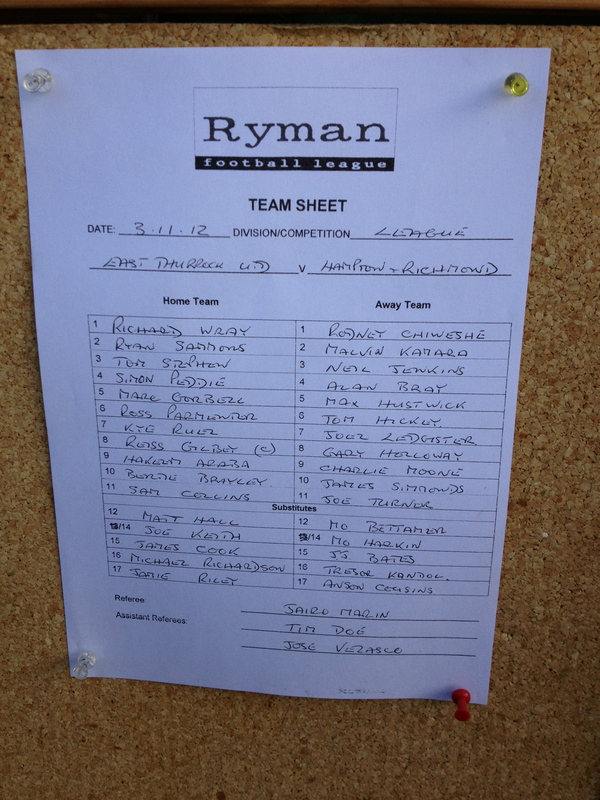 Posted on November 5, 2012, in UTL Archive and tagged Charlie Moone, East Thurrock United, Hampton & Richmond Borough, Isthmian League, Joel Ledgister, Reiss Gilbey, Ryman League, Sam Collins. Bookmark the permalink. Leave a comment.